I’m just a novice gardener, I’m not a farmer like several of my friends but I’m not doing too badly either. This year is my third year having a vegetable garden in this location, I did have a successful garden years ago at another home which had plenty of sun unlike my spot here. The endless shade in my yard throughout the day is a great thing when you want to sit outside enjoying spring, summer and fall but it’s not so great for my garden as you can imagine. Considering this, growing an abundance of produce has been challenging. I can grow kale from spring through fall, I have also had good luck with string beans and certain herbs, very small bell peppers, tiny cucumbers if any and if the frogs stay away from them. Yup, I have a brook running beside my house and it seems to attract some type of pointy nosed frogs who love to eat the insides of my cucumbers leaving the skins fully intact; it’s not such a great moment when you think you have this beautiful cucumber and as you pick it up it’s just a shell! Heartbreaking. One thing that my good friend Clem down the street who is a farmer in every sense of the word taught me how to grow last year was garlic. I planted eleven bulbs and had a successful crop of eleven garlic scapes which I used in several different ways and garlic scape hummus was the biggest hit, especially to my cousin’s 3-year-old son, he absolutely loved it! 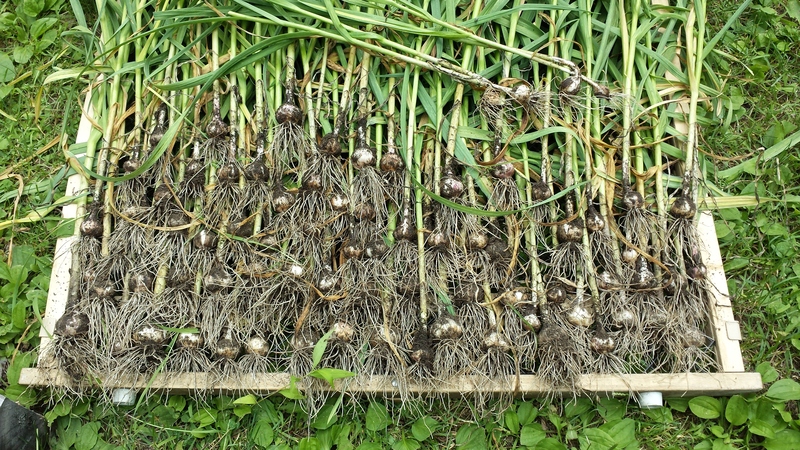 When it was time to harvest the garlic bulbs I of course had eleven which I saved every one of to plant in the fall. Last fall my oldest son was around so he helped me plant 83 cloves of garlic then we covered them with hay until spring. As the last bit of snow melted in April I removed the hay to find small sprouts stretching their arms up toward sunlight – once again I was elated! 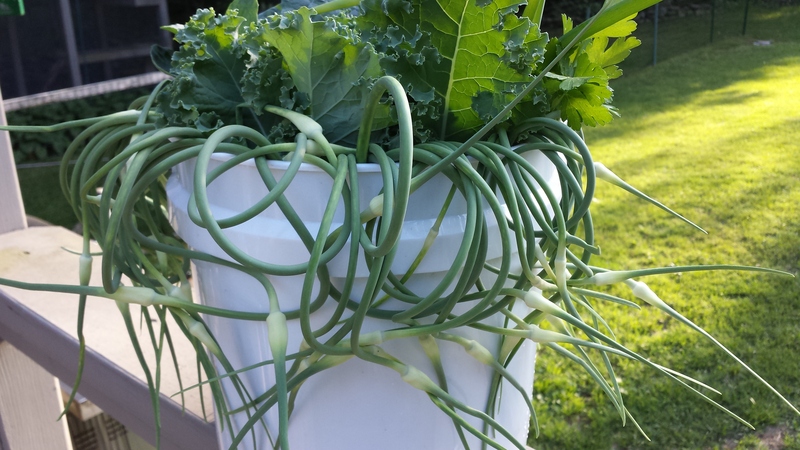 A few weeks ago I snapped off all the garlic scapes, I had enough this year to share so I did and I kept some too. I will freeze whatever I don’t use this week after making more hummus and a garlic scape & herb pesto. Today I harvested all 83 garlic bulbs and laid them on an unused child gate to dry. I’m drying them in my cellar which is light enough and has very dry air all the time. I only pulled two sets of twins this year which I will not plant next year per instructions of farmer Clem; but they will make good eating! 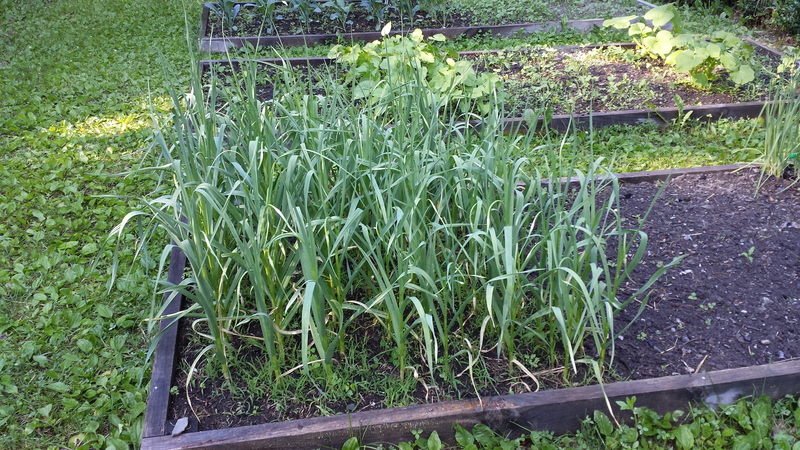 I thoroughly enjoy planting, growing, and cooking with garlic scapes and garlic so come fall, I’ll plant more than 83. I’m going to plant the largest of my bulbs and look for larger bulbs at the local farm stand to plant. If you feel even slightly interested in trying to grow your own garlic I say go for it!